The rose is beautiful by its appearance, but it does have a thorn on it which may hurt us. 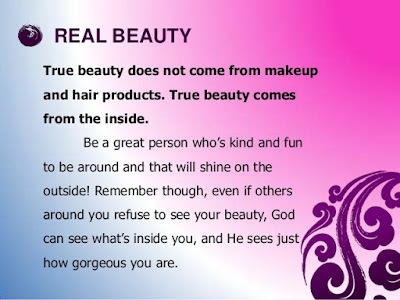 The beautiful people which we see through our eye can’t be that beautiful because the appearance can be made by applying the cosmetics and artificial things, but the real inner beauty can't be seen either we can touch. The utmost beauty shines from heart and soul and which gives the everlasting happiness and joy which can’t be obtained whatever we may by using the materialistic substance. True beauty doesn’t consist of the physical appearance, neither it possesses the tangible shape. We can’t figure out the true beauty by observing by our eye, but we can use our heart to realize it. The true beauty can be hardly seen in real life as it is something with a mind and inner soul. We can feel the real beauty of the people by how someone behaves, how they love and care about the people and expression of love and compassion, cooperation, and support for the people who are in need. It can be heard or realized by our heart throughout the expression, through the way what someone behaves. It could come with the kind words, the thought toward the humanity and even a simple smile for the inspiration. Even the beautiful people with the selfishness, only the willingness to live the life and with the intention to grab the opportunity along the way and only want to have every possible thing alone to deserve can’t be determined as a real beauty of the world. Rather the beauty can be realized as the moments of who laugh by feeding the people having the trouble of joining the hand and mouth and who devotes the life of someone to fix the goal who are deprived of educations and other basic needs. The notion of the beauty varies people to people depending on their level of thought, understanding, and perception. But whatever the people think about the beauty regardless of their opinion, the real beauty shines only in the humanity, cooperation, and the kindness. It is not related to the appearance rather it is connected to the unity, compassion, creativity, expression of pure love that is heard by the innocent heart. A beautiful mind is an inspiration to all the human being, especially to the people who are in need of love and compassion. Except them, mutual harmony, respect, inspiration, support, enhancing the people’s capabilities, and the internal willingness of support for all the human beings are the forms of true beauty, which we can’t see but can realize by the way how someone works out.